THIS EVENT HAS HAD TO BE POSTPONED DUE TO LICENSING ISSUES WITH THE VENUE, WE ARE CURRENTLY IN DISCUSSIONS TO SECURE A NEW DATE AND VENUE AND WE HAVE MAILED ALL THOSE WHO HAVE BOUGHT TICKETS, SO PLEASE CHECK YOUR MAIL IF YOU HAVE NOT RECEIVED (SENT 14/07). WE SINCERELY APOLOGISE FOR ANY INCONVENIENCE CAUSED AND HOPE THAT YOU CAN ALL STILL JOIN US WHEN WE SECURE THE NEW DATE. FOR ANY ENQUIRIES PLEASE CONTACT US USING THE CONTACT ORGANISER LINK ON THIS PAGE. Hi Dundee: Award winning Family fun for the post-rave generation of parents. Helping parents be responsibly irresponsible with family raving since 2013. We are the premier and award winning family rave experience having proudly won 3 years in a row at the National Family Arts Festival Awards, running events UK wide with the pick of the crop when it comes to DJ talent. We’re c Dundee making our debut in Dundee in 2017, and we are real excited to be coming to the Reading Rooms! IN JULY WE’RE COMING TO DUNDEE!!! YES, we ARE!!!! We’re having a Once Upon a Time themed rave, as we thought that was so fitting for the venue, it’s optional but we fully encourage you to dress up, it’s all part of the fun! Who will be playing for us? * Special guest this month we have Alan Dobson a veteran DJ and promoter well known to Dundee. Previously you would have found him playing and promoting club nights like Progression in Scotland, he is a proud resident at the legendary Rhumba Club, and Quarterly resident at Musika, but Dundee will surely know him as also being resident and promoter of Spektrum that run Nights monthly at the reading rooms. 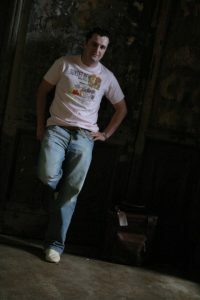 Alan has had the pleasure of playing along side a number of the worlds best DJ’s including: Deepdish, Pete Tong, Darren Emerson, Steve Angello, Sander Kleinenberg, Layo and Bushwacka, Hernan Cattaneo, Steve Lawler, Danny How.. and we are sure he will deliver a perfect opener for Big Fish Little Fish coming to Dundee for all you family ravers, so get your mnusic on, jump around with your kids and get warmed up, because we have one month to go! get your tickets in sharp ..
Dundee Managers and venue sound technicians constantly monitor sound levels to be safe for even the smallest ears throughout the event. No buggies are allowed INSIDE the venue, we encourage use of slings where possible, but there is a dedicated and well covered buggy park at the entrance. The event is conducted indoors with club lighting (no strobes), we advise when entering please allow a few minutes for your eyes to adjust. Please no running!